I’m currently in London, and with so much history and grandeur to explore, I am still most excited about a quick trip to Elstree studios. Only because this is where Star Wars was filmed! Coincidentally, it is once again May the Fourth, so I have yet another excuse to share my love of Star Wars with you! It doesn’t seem like an entire year has past since I first let you in on my personal secret hobby of making Star Wars Smurfs. It’s been a busy year, so I’ve only been able to create a few more. So many characters still to go! I thought about showing you some new ones, but that would be so redundant! I’ll save those for later. 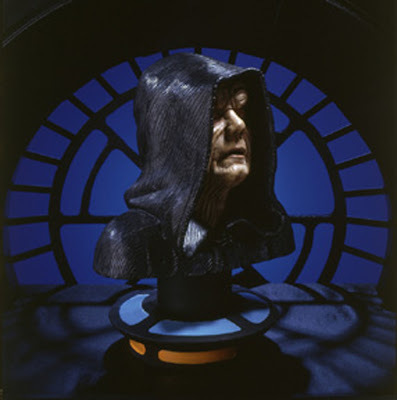 Instead, I wanted to share my first major licensing partnership with Lucasfilm: a series of collectible busts I created for Legends in 3 Dimensions. Photo 1: When I first started L3D in 1994, my partner Henry Unger asked me to create a list of the licenses I wanted the most. Of course, Star Wars was at the top of the list. But I felt it was there more as a goal than a reality. I figured it was beyond my reach, and too large of a franchise for my fledgling company. Well, Henry worked his magic and got us a meeting up at Skywalker Ranch almost immediately. So fast in fact, that I hardly had any examples of product to show. At this point, we had only secured two other properties, and those sculptures were both in the works. Henry had sent Lucas a copy of my General Urko bust from Planet of the Apes, and that got them interested in meeting with me. But I felt I needed something really special to seal the deal. So I picked one of my favorite characters and sculpted my first Star Wars bust to show the caliber of product I wished to deliver. 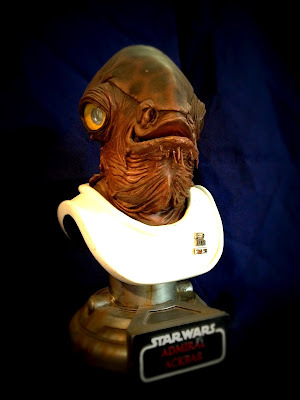 Sadly, although Admiral Ackbar is probably still my favorite L3D bust, this prototype is the only one in existence. The approval department at Lucasfilm requested some changes, which put the piece on the back burner, and he never made it into the fold again. The saddest part, thinking back, is that the only major alteration was an alternate version of the nameplate, which they felt was too “retro”, which I guess is was, as I based it on the original Kenner action figure card backs. Photo 2: My original presentation for the L3D Star Wars lineup included mostly obscure characters. With Star Wars being at the height of its popularity today, it may be hard to remember a time when the brand only focused on main characters such as Luke, Han, Darth, R2, and 3PO. You may even be too young to know that pre-prequel background characters didn’t even have names so much as “descriptions” we only knew of from the Kenner action figure card backs. 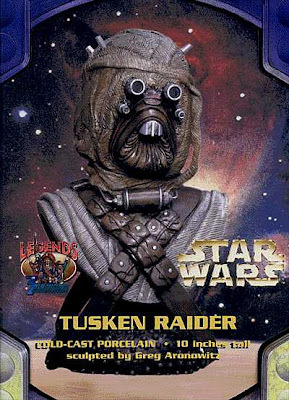 But we still loved them all, and in the late 80’s and early 90’s, when new merchandise was scarce, I spend most of my money tracking down rare gems I couldn’t obtain in my childhood, such as the elusive vinyl capped Jawa, or the European released Yak Face. 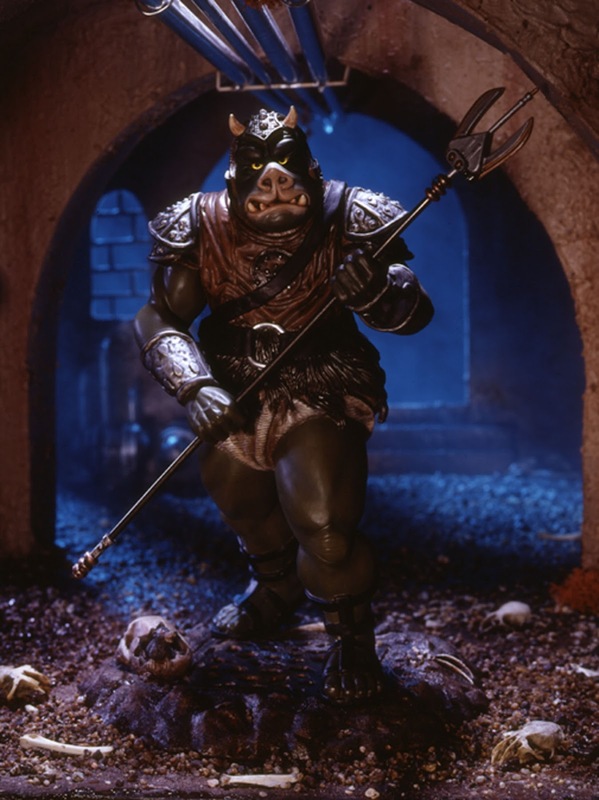 My vision with L3D was to bring those creatures that only got a few seconds of screen time to endear themselves to us into the spot light and immortalize them as busts. I figure if I would pay $950 for a 3 ¾ used Yak Face, someone would love to have him as a brand new bust for $99! The compromise was that I would do a rarer main character that also supported the franchise’s most recent effort to provide fresh content, the multi-platformed “Shadows of the Empire”. 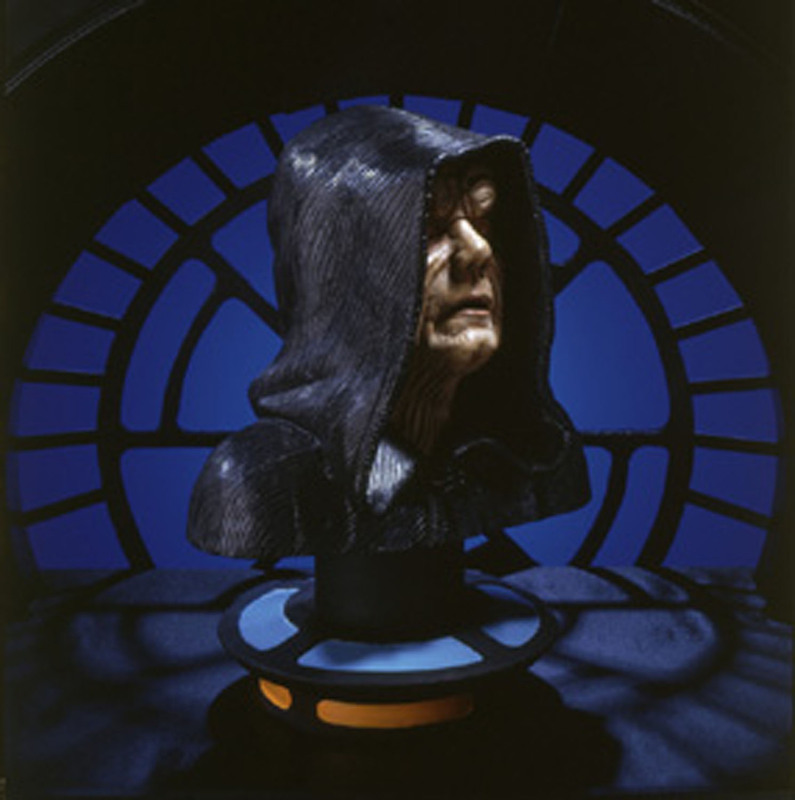 So I sculpted my first OFFICIAL Star Wars bust, Emperor Palpatine. I wanted to give each character a base that connected them to their environment, and while creating this “throne room” pedestal, I decided to forgo the nameplates, which then followed through for the majority of L3D busts. Photo 3: The natural follow up to the Emperor was a bust of Boba Fett. The notorious bounty hunter was deeply integrated in the Dark Horse comics version of Shadows, and had been a fan favorite since he first appeared in animated form in the Star Wars Christmas Special way back in 1978. 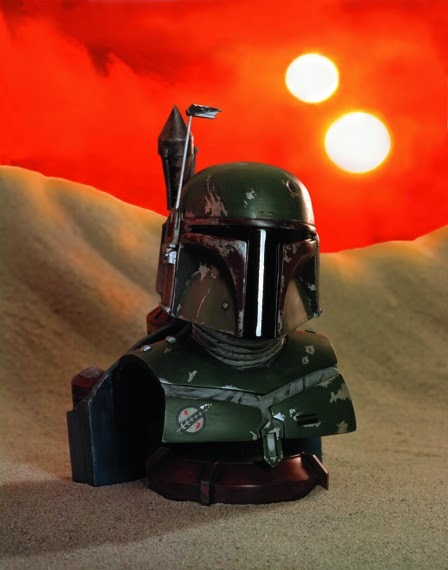 Once again, up until the late 90’s, there was very little merchandise surrounding this supporting character, so it was a great opportunity to satisfy a growing hunger for Fett fans. Photo 4: When I start to write these blogs, I always worry that there won’t be enough to talk about on any given subject. But as I start to pull the images, tons of stories flood back into my mind. One specific thing I remember about creating this bust was controversy over the paint scheme. I presented my prototype based on the Jedi version of Boba, who is commonly known as the “carnival version” due to the bright primary colors on his jet pack. The approval department rejected it, stating that Boba Fett was always all olive drab, and provided photos from Empire Strikes Back. I was determined to keep the vibrant colors, so I took my SW laserdisc box set and “stepped” frame by frame through both movies, capturing the slo-mo on VHS to bring to the ranch for proof. Like I said, this was a long time ago. The staff was shocked to realize there were differences in the character between movies, and granted me permission to run the carnival version. Since it became so glaringly apparent after this process that there were TWO different Boba Fetts, I decided to do a limited edition variant of the ESB version. We only made 500, and they are so rare, I don’t even have one! 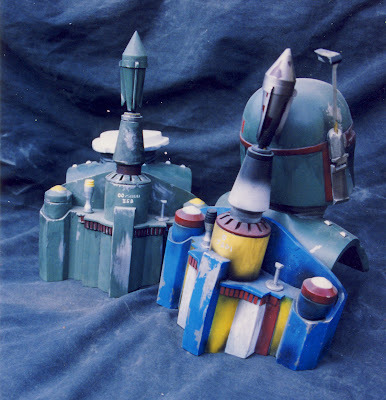 This photo is of my original paint masters, which were destroyed in China after the manufacturing run. Photo 5: Having the Star Wars license brought the company a lot of attention, and the Boba Fett variant got a lot of press. Some of my favorite articles are printed in magazines I can’t even read, like this full page in HOBBY JAPAN. You can see a shot of me working on the Emperor in the lower right corner. Notice the reference book I’m looking at. It’s the Japanese version of Star Wars Chronicles . The book has highly detailed photos of almost every prop, model, and costume used in the original trilogy. 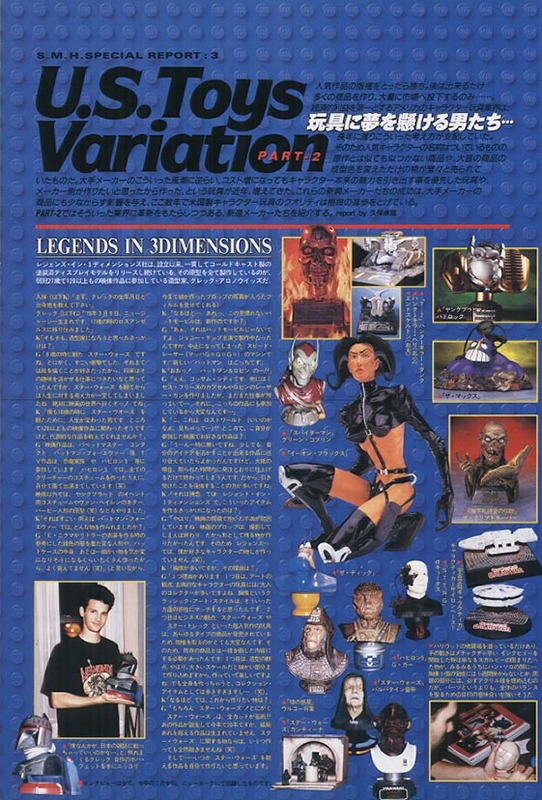 It was originally released in Japan, and later there was an American version available. If you don’t own it, you should! 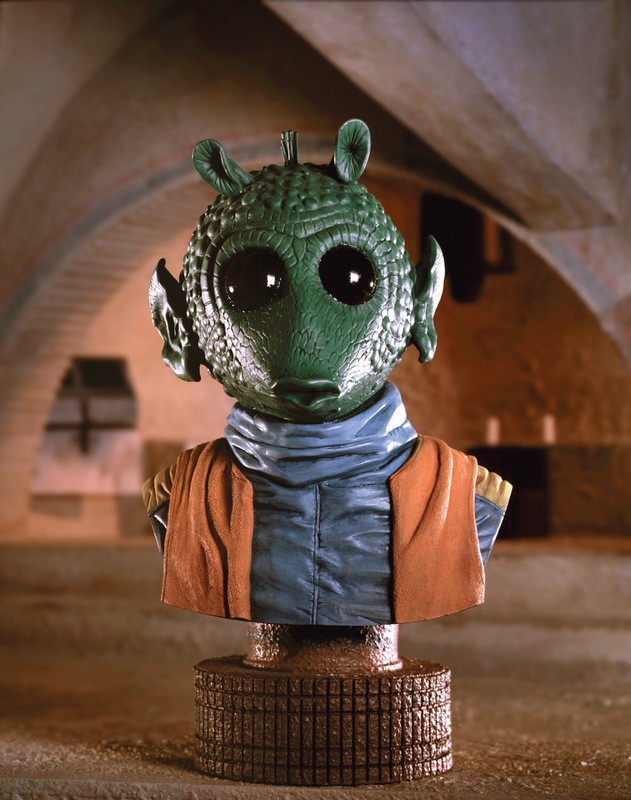 Photo 6: Of the L3D Star Wars busts actually released, Greedo is my favorite. I tried to capture his blank expression, subtle head tilt, and groovy 70’s ski jacket. His base is, well, based on the set itself, drawing from the tiled archway tiles and the stucco earthen walls with faded stripes. 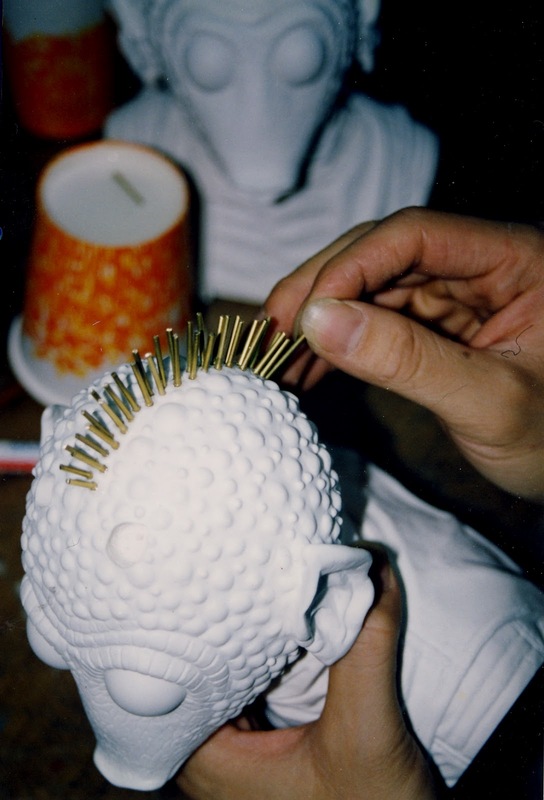 Photo 7: This became the first manufacturing challenge for L3D, since I decided to have the Bounty Hunter’s mohawk of spines laid in with individual brass rods. There are about 100 spines per head, all hand glued in place. I also built the miniature sets for the product shots. Mos Eisley was probably the most fun to build, and with minor modifications, I was able to use it for several of the other bust, as the cantina was a huge source of inspiration for the L3D lineup. Photo 8: So, it goes without saying that there would be a Cantina Band Member. I know they all have individual names now, but when I was a kid, they were simply known as the Cantina Band. What makes the band member bust special is that it was my only use of hands in an L3D SW bust. I wanted to keep the pieces as close to the classical form as possible, but I felt that it was the instruments that really connected these aliens to the band, and most of them were woodwind style props. I went with the one that resembles a flute, as it was compact enough to keep the bust proportionate to the others. Photo 9: Another unique quality was my use of airbrushing on the piece. I usually tried to avoid this technique, as it often ended up being overly done in production and giving the end product a cheesier, cheaper look. But the color scheme on these creatures was so subtle, standard brush processes were even more risky. In the end, the factories nailed it, and the Cantina Band Member sold out almost instantly. Photo 10: Putting this blog together, I suddenly realized that majority of the L3D Star Wars line are inhabitants of Tatooine. 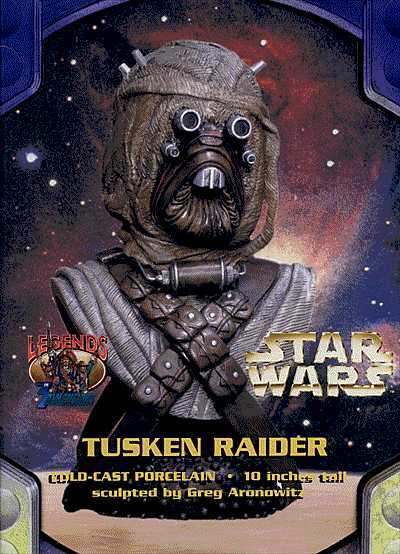 I guess I was drawn to all of the rustic textures, especially on the Sandpeople, or Tusken Raiders. Wrapped head to toe in protective bandages to shield them from the double suns, the Raiders viewed the world through aluminum tubes breathed through heavy leather sand filters. Photo 11: This bust involved as much machining as it did sculpting. The base is designed to represent the head of the Raider’s Gaffi stick, and I tied him to it by continuing the bandolier straps past the bust cut off. In order to ensure that these thin straps would last on your shelves, I tooled them to be cast separately out of pewter. I needed to engineer deep pegs into the backs of the straps to lock into the cold cast porcelain bust to make sure they held on securely, since even the strongest epoxy has trouble binding the metal. Photo 12: But not all of my over-engineering makes it to the final product! 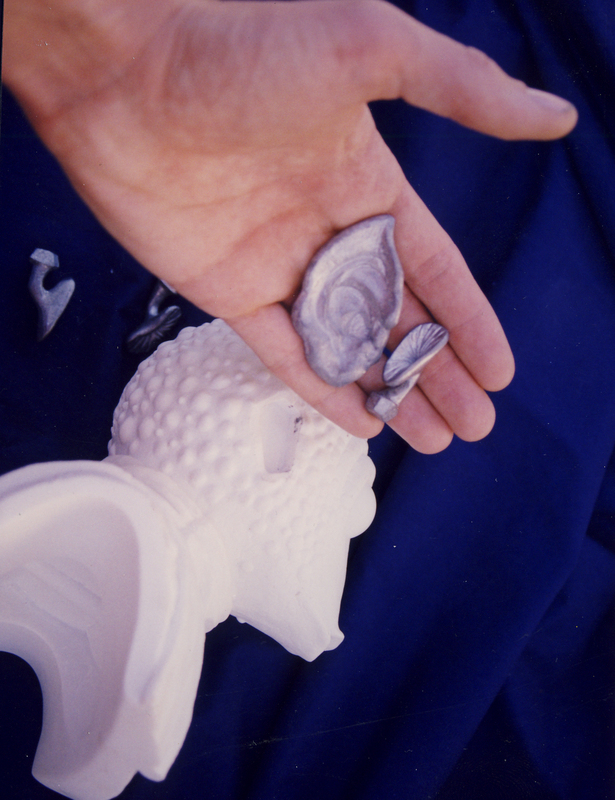 I was very concerned that Greedo's large, pointy ears and suction cup like antenna would not survive in polystone, so I initially opted to make them as separate white metal pieces. The ears turned out to be too heavy, and we had more issues with them falling off in the drop tests then we had breakage with the cold cast ones. I believe the pewter antenna stayed, although it has been 16 some-odd years since I reviewed these things on the assembly line, so I could be wrong!!! Photo 13: Many of the Star Wars bust had complicated elements like the straps and ears, so I came up with the idea of showing random steps of the process on the certificate of authenticity. I love Star Wars for many reasons, but perhaps most of all for introducing me to “behind the scenes” at such an early age. Lucas never had any reservations about pulling back the curtain and revealing exactly how he made the magic, and who the artist were that helped him make it happen. 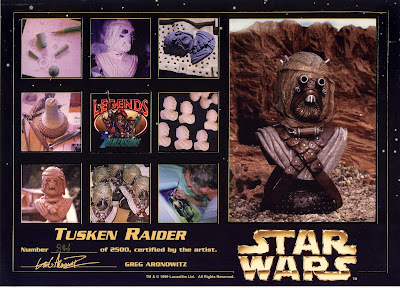 Even in the original Topps trading card sets, images of models in progress, concept art, and sets under construction found their way between the final film frames and character glamour shots. In my mind, “the making of” is just part of the Star Wars esthetic, so I tried to include as much of that in my product as possible. 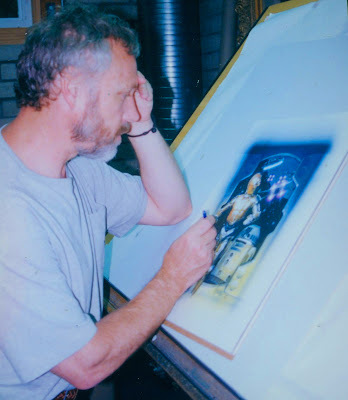 Photo 14: Speaking of the Star Wars aesthetic, there is one man whose art is synonymous with the franchise: Drew Struzan. Drew has illustrated some of the most famous Star Wars posters. He also gave us a wide collection of book covers and promotional art since the galaxy far, far away was first brought to our attention. When it came time to create the box art, it was the only logical choice for me to ask Drew to do it. I had been creating the most of the L3D box art myself up to this time, but in no know universe could I even dream of bringing the Star Wars characters to life the way that Drew does. Photo 15: Drew created 4 unique panels for the box: two sides, the back, and the lid. He designed a “space port” border to connect all the paintings as the wrap around the box, and I cut out the character art from one of the panels to create the border for the box front window. Each panel is so beautiful, I couldn’t begin to pick a favorite. But being as R2 and 3PO are my favorite characters, it was a dream come true to have this piece of art created exclusively to house my sculptures. Photo 16: The opposite side of the box featured a squad of Stormtroopers charging at us, with TIE fighters blasting something into smithereens in the background. Photo 17: But without a doubt, the greatest Star Wars moment in my life came from seeing this piece of art. It was customary to include a photo of the artists involved in the sculpture on the back of the L3D box, and Drew asked me if I planned to do the same for Star Wars. I was going to be the only sculptor, so Drew asked if I wanted him to draw my portrait instead of using a photo. Drew is most famous for his portrait work, immortalizing the likenesses of Harrison Ford as Indiana Jones, Michael J. Fox as Marty McFly, and Dustin Hoffman as Hook, just to name a few, so it was a great honor to have him do an illustration of me. Photo 18: While designing the box layout, Drew decided that I needed to integrate into the Star Wars theme rather than just be a floating head on the back of the box. So he put my head on Luke Skywalker’s flight suited body from Empire Strikes Back. 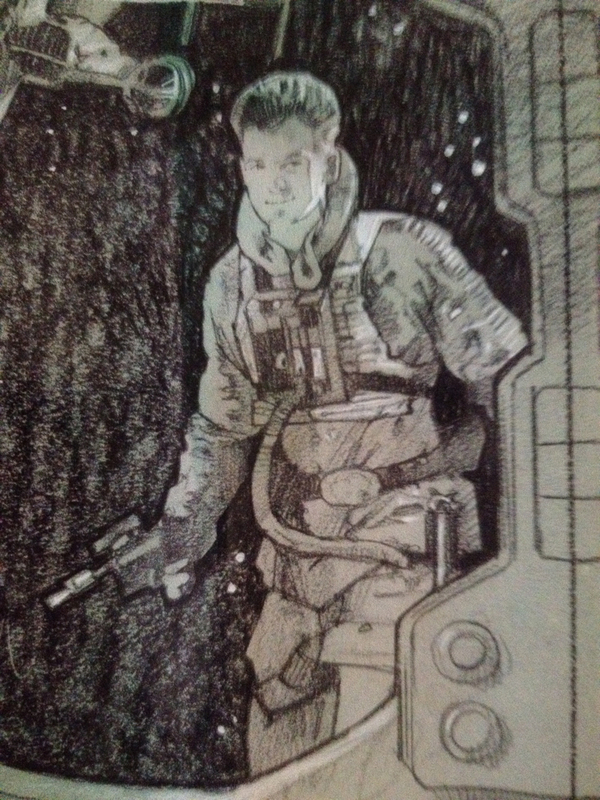 He gave me this black and white comp to submit to Lucasfilm, and I nearly passed out! It was the coolest thing I had ever seen, but I was pretty sure that there was no way that George was going to approve it! That moment will forever be the highlight of my geek life. Drew removed the lightsaber, and the finished art made it onto the box. I guess this made me the first person not in the original films to be represented as a Star Wars character on official merchandise! Photo 19: The Star Wars line was very successful, and I was invited to Skywalker Ranch a lot to talk about new product and to show my progress on new pieces. During one trip, I was in the president of Lucasfilm’s office when I noticed that he had my 1/6th scale sculpture of the Gamorean Guard on his desk. When I mentioned that I had created it, the room went very quiet. It turns out that the sculpture had a lot of history with the company, and as much as they loved the art, it came in their possession in what was viewed as a very negative way. 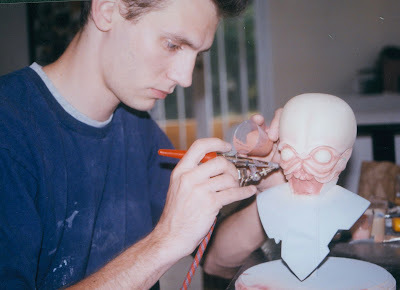 I had sculpted the pieces years earlier to be a resin garage kit when that was a popular hobby. I never actually finished it, but a friend who owned a specialty model shop saw pictures of the work in progress and asked if I could finish a prototype for him to present to Lucasfilm in hopes of getting an official license. When the company got the statue, it came with rumors that they were already available on the underground kit market. They sent my friend a cease and desist letter, but kept the Gamorean Guard. I had only heard that the license had not been approved, and I thought my friend kept the original. I explained that the piece Lucasfilm had been the only one in existence, and that I had the original molds locked safely away. We were able to work out a deal that let me finally release the sculpt as an official product, but the president still kept the original prototype! 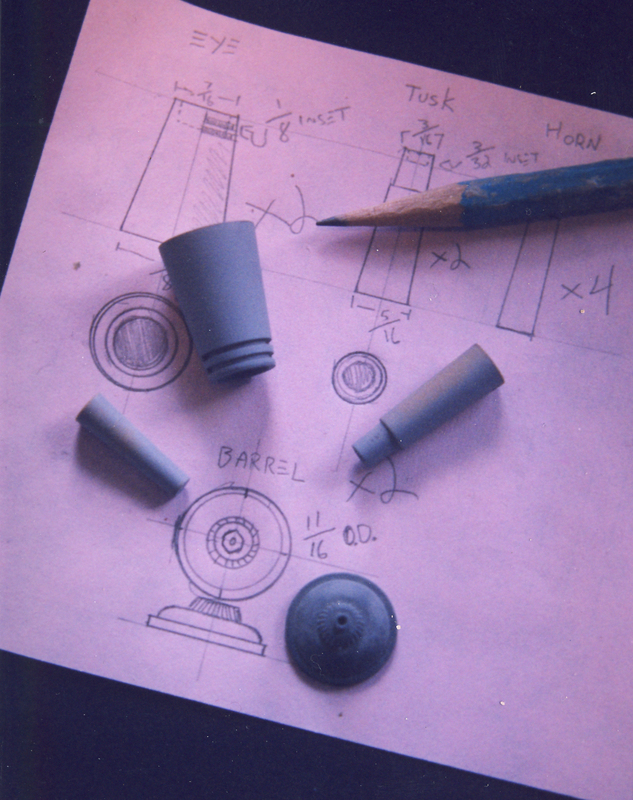 Photo 20: I had big plans to continue the L3D Star Wars line, and hopefully someday I will get to continue that vision. I got to do some cool interactive promotions with Lucasfilm in the meanwhile, like this full size Jabba the Hutt photo-op for Star Wars Celebration 1. Over the course of the 3-day weekend, we ended up shooting hundreds of digital photos with excited fans. It was great to be able to share my love for Star Wars with so many people in person, and learn that I had made so many of them happy with my sculptures. Hopefully you are one of them! May the Fourth be with you!!! !